Tennis Court Construction Sydney. Synthetic Grass & Clay. Sportszone Group are tennis court construction specialists. We install and resurface synthetic grass, synthetic clay and acrylic tennis courts. At Sportszone Group we understand that a tennis court is an asset that adds value to your home or tennis centre. We aim to provide a high quality surface that will give you many years of enjoyment and wear. Our services include full construction including the court surface, fencing, lighting, planning and development. We also offer a range of tennis nets, posts and tennis court maintenance equipment and ball machines. 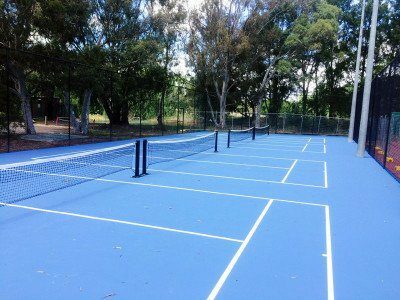 We have over 15 years experience installing tennis courts in private homes, sports clubs, schools, aged care, universities and government sites, including the Australian Sports Commission. We take pride in every aspect of the job and our client’s satisfaction is guaranteed. 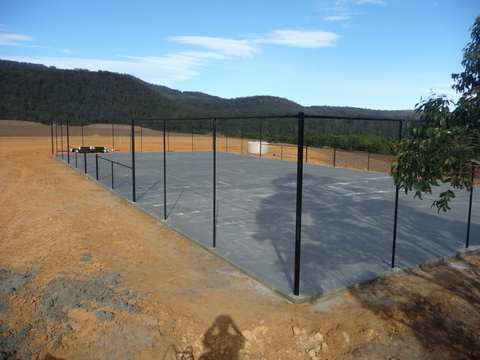 We can install tennis courts with a variety of base construction including concrete, stabilised bases and asphalt. We offer a choice of tennis court surfaces including artificial grass, synthetic clay or acrylic hard courts. The team here at Sportszone Group are more than happy to talk with you about the design and construction of any hard court you plan to build or resurface. We use Rebound Ace for our hard courts. Rebound Ace is an acrylic sports surfacing system that can be customised to achieve the desired performance, playability and appearance, making it an incredibly cost-effective way to breathe new life into asphalt or concrete surfaces. Rebound Ace is easy to maintain, and re-coating can extend a court’s playing life or transform it completely. Find out more about Rebound Ace here.